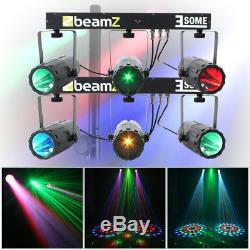 2x Beamz Bright Scatter Effect LED Disco Lighting Rigs Plug & Play Laser Lights. 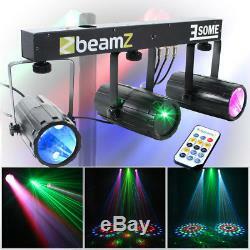 Get the party started with two of the Beamz 3-Some complete lighting rails. A truly unique design: with two multi-colour lamps and one multipoint laser connected together, for instant performance alongside your party and DJ sets. Forget long and tiresome lighting setups: these lighting rails are ready for plug in and play to unleash its multi-colour rays and red & green laser beams across venues, in stunning moonflower bursts and widespread firefly effect patterns that will spread through the crowd and flash, swerve and react to changes of the music beat using sound activation. Or, alternatively, these lights work in an automatic mode as well! The individual lamps can be adjusted accordingly to direct in different angles, giving users a wider spread of the effects and ensuring not a thread of the crowd is uncovered on the dance floor. These lights come with holes in their brackets for attaching to tripod stands: suitable for DJ decks, disco dance floors, catwalks and on stage. FFA1431 - Beamz 3-Some LED Moonflower Red & Green Laser Lighting Rail. Three's the charm with the Beamz 3-Some complete party lighting rail, with two multi-colour lamps and one multipoint laser connected together for instant performance alongside your party and DJ sets. Forget long and tiresome lighting setups: this lighting rail is ready for plug in and play to unleash its multi-colour rays and red & green laser beams across venues, in stunning moonflower bursts and widespread firefly effect patterns that will spread through the crowd and flash, swerve and react to changes of the music beat using sound activation. Or, alternatively, this light works in an automatic mode as well! Operating the 3-Some is made easy thanks to the included IR remote control, allowing for complete wireless control. The 3-Some has a mountable hole on its bracket for attaching directly to tripod stands and is wonderfully portable; the mobile DJ will find this unit a marvel with its set-up-and-go capability. Stunningly strong visuals, adaptability and versatility is what the 3-Some boasts: use as stage lighting, catwalk and fashion shows, karaoke disco lighting, and pair alongside smoke or fog effects for the ultimate party atmosphere! Please note this light does NOT have DMX and is NOT linkable to other units. THE IMAGE SHOWS A FADED STAND FOR DISPLAY PURPOSES ONLY - PLEASE READ THE LISTING CAREFULLY AS TO IF THIS IS A PACKAGE WITH THE STAND INCLUDED. Three connected lights for plug in and play. Alternative and multiple angles for maximum coverage of venues. Stunning moonflower beam effect light. Eye-catching red & green firefly effect laser. IR remote control included for wireless operation. Sound activation mode dances along to the music. Ideally mountable to tripod stands. Great for parties and discos. Strong bar/rail for supporting lamps. Red, green, blue and white LEDs. Additional mounting bracket for central mounting. LEDs: 27 x White, 36x Red, 54x Green, 54x Blue. Laser: Green Laser 70mW, Red Laser 100mW. Supply Voltage: AC110-240V 50/60 Hz. Modes: Sound active, Auto, Remote control. Dimensions: 615mm x 110mm x 335mm. Video will open in a new window. A tracked service is available when you select a 48 hour or 24 hour courier service. Due to our carriers charging extra for Highland and Islands, we need to pass this charge onto our customers. Where do you deliver to? We deliver to the UK, Ireland and internationally covering most of the EU, including. All deliveries will require a signature so please ensure someone is present to sign for the item. It will be displayed as a seven-figure code e. Can I amend my order? Before dispatch: you can amend your order, or cancel your order at any time. What if I have not received my order? All of our listings are given a non-negotiable, fixed price. However, If the item is B-stock, clearance or damaged we may accept offers on price. We may have already answered popular enquiries and questions on our FAQ page. If you have any enquiries, concerns or questions about your order, our policies or any of our products: our friendly customer service and sales team are on hand to assist you with anything you may require. We are open 6 days a week, excluding bank or public holidays & annual holidays. The item "2x Beamz Bright Scatter Effect LED Disco Lighting Rigs Plug & Play Laser Lights" is in sale since Wednesday, July 23, 2014. This item is in the category "Sound & Vision\Performance & DJ Equipment\Stage Lighting & Effects\Stage Lighting Systems & Kits".